This page describes some basic rules and information that will be important for Out-of-Area Agents and New Agents who have listings in the Rancho Bernardo area. These rules and CC&R's have played a significant role in maintaining the standards for development in the community, and extend to some long standing rules that include how properties are presented for sale, such as the sign rules. Each neighborhood in Rancho Bernardo belongs to one or more Home Owner Associations or Community Centers that may have their own specific variations of the rules and regulations. Many community members take great pride and importance with these standards, and an agent who is not in compliance may risk offending local residents. It's pretty easy to work within the guidelines, as long as you know what they are. There are sign restrictions in Rancho Bernardo and recently they have been vigorously enforced. 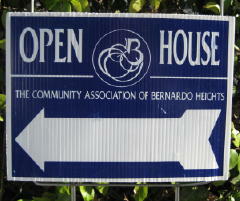 For sale and open house signs anywhere in Rancho Bernardo cannot exceed 9"x12". In addition, you may not use flags, balloons, etc. with the signs. There is a Rancho Bernardo Real Estate Broker's Meeting and Open House Caravan every Thursday morning. You may schedule your listing for the broker open house by adding it as a "Tour" in Paragon. Then, come to the RB Broker Meeting at 9:00 on Thursday to pitch the property prior to the open house. The pitch is mandatory, though you are allowed to have some other licensed person pitch it for you. If the property is not pitched, it will be scratched from the open house list. The broker meeting is held at St. Bartholomew's Episcopal Church, 16275 Pomerado Road. If you arrive between 8:45 and 9:00, just follow the crowd of agents to the meeting room. There is a $1 admission fee to cover the cost of coffee. You may only place a property on the broker open house once every six months. Retours are only allowed if there has been a dramatic change in the condition of the property or a price reduction of 10% or more. If you choose, you may offer refreshments or a cash drawing to entice more agents to come to your open house. This is strictly optional. After the broker meeting, just go hold the house open. On any given week, there are 5-20 new listings on the open house caravan. Therefore, the number of agents who will come to your open house is difficult to predict. That's about it. Good luck with your listing and, if you have any questions, feel free to contact me by email Bret.Geernaert@camoves.com or by phone (858) 354-9002. Bernardo Heights is one of the communities within Rancho Bernardo. 1) They are available for sale at most of the local sign companies (Champion Sign, etc). 2) Most real estate offices in RB have them so you may be able to borrow them. 3) They are available to check out on a daily basis at the Bernardo Heights Community Center on Avenida Venusto at Bernardo Heights Parkway. They demand a $20 deposit which is refundable when you return the signs. The Bernardo Heights Community Center is located at 16150 Bernardo Heights Parkway, San Diego, CA 92128. The telephone number at the Bernardo Heights Community Center is (858) 451-3580. If you place any other signs in the common areas of Bernardo Heights, they will likely be confiscated and destroyed. Carmel Mountain Ranch is adjacent to and south of Rancho Benrardo on the East side of I-15. The signs in Carmel Mountain Ranch are NOT limited to 9"x12" in size. These communities are adjacent to and west of Rancho Bernardo in zip code 92127 on the west side of I-15. They are NOT included on the Rancho Bernardo Caravan at this time, because they now have their own Caravan (Tour #27). These communities have their own rules, and it is the responsibility of the agent to determine the local requirements. Even though part of zip code 92128, Sabre Springs is NOT part of the Rancho Bernardo Caravan at this time. Check with the Poway PREP Broker Group (Tour #64) for information.